This is the first of the twelve volume AtLantic Policy Studies being sponsored by the Council on Foreign Relations. 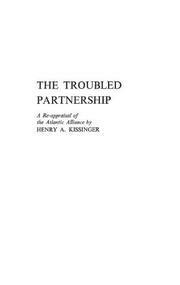 In taking up the subject of United States relations with Europe, Dr. Kissinger has been able to_expand the material he touched upon in The Necessity for Choice. His examination, of course, is primarily in terms of Western defensive strategy and heavily influenced by his complex theories on nuclear deterrence which he introduced in Nuclear Weapons and Foreign Policy. The military problems of the Alliance are closely involved with and interact upon its political and structural situation. The tremendous recovery of war-torn Europe, coupled with a re-identification of national attitudes, must be reconciled with the need for European integration, and the United States must be willing to re-evaluate its standing with the European nations individually and as a unit. Politically this involves reaching an agreement on the reunification of Germany and an understanding of the divisiveness of Europe, which has been too easily symbolized by De Gaulle's refusal to include Great Britain in the Common Market. Dr. Kissinger probes into the inconsistencies of NATO's defenses especially with regard to the use of conventional weapons, and provides an alternative to the Multilateral Force in terms of the stronger, more cohesive Europe which he forsees. For the astute in international affairs this is a provocative study by Harvard's military analyst.